“Creative Journey” offers a case study into how a small sugar company grew to become CJ Group, a global lifestyle company and the nation’s largest cultural contents provider. 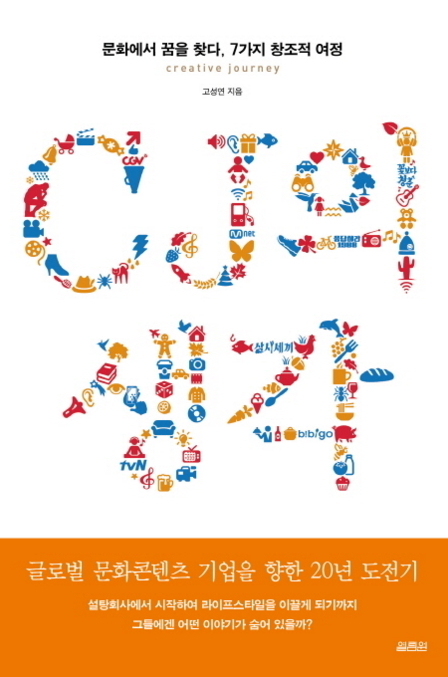 Locally, the letters CJ have now come to represent Korea’s popular culture, from films, music, and TV programs to food, and the worldwide hallyu phenomena, writes author Ko Seong-yeon. Ko, a journalist with expertise in creative content and who holds an MBA in design thinking from London’s Imperial College, argues that CJ Group’s development simultaneously traces Korea’s transition from a manufacturing-based economy to a service-focused one. The book focuses on several facets of the conglomerate’s successful enterprises and how it achieved the mass-industrialization of culture through a distinctly business-minded approach to creativity. In the film industry, CJ became the largest distributor of films in the country by benchmarking Hollywood’s film production system to create Korea’s own version of blockbuster movies, Ko says. It targeted both popular appeal and a growing demand for stylistic indie pictures through its multiplex theater chain CGV and a line of arthouse cinemas, Arthouse CGV. In television, CJ was able to produce drama series that set new milestones by capturing the zeitgeist. The 2014 series “Misaeng” tapped into the routine ups-and-downs of life of a Korean office worker, while last year’s “Reply 1988” hooked onto people’s nostalgia for a simpler past. The book further delves into CJ’s foray into the Chinese market and how it capitalized on the hallyu boom.